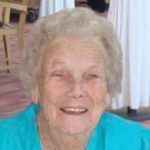 Ardith A. Dowling, 97, of Adrian, formerly of Clayton, passed away on March 5, 2019, at Lynwood Manor in Adrian. She was born on November 14, 1921, to Burr and Gladys (Hanlin) DeLine. On March 11, 1944, she married Clifton (Kip) Dowling in Gainesville, Texas. Kip preceded her in death on December 29, 1999. Ardith and Kip had one son, Gary (Laura) Dowling of Somerset; two grandchildren, Brian (Jessica) Dowling of Somerset and Kate (Daniil) Barbiyeru of Chicago; two great-grandchildren, Benjamin Barbiyeru and Coralynn Dowling. Also surviving are Ardith’s sister, Lois McNeil of Clayton; nephew, Rick (Chrisanne) McNeil of Adrian; and nieces, Morgan and Maddie McNeil. Ardith was preceded in death by her husband, parents and brother-in-law. Ardith was an active member of the Clayton Women’s Club, Clayton Extension Club, Clayton United Methodist Church, and Clayton Summerfest Committee. As a life-long resident of Clayton, Ardith was known and loved by her community. Ardith retired from Townsend Lumber Company after 50 years of employment as their bookkeeper. However, her most important job was being a devoted mother and grandmother. You would often find her out in the yard playing with Brian and Kate or allowing them to build structures in the yard, attending basketball games or helping Brian in his fish business that was housed in Ardith’s pole barn. A memorial service will be held at 11 a.m. April 13, 2019, at the Clayton United Methodist Church. Visitation will be held from 10 to 11 a.m. with the memorial service and luncheon immediately following. A private family burial will take place at a later date at North Dover Cemetery. Memorial contributions are suggested to the Clayton United Methodist Church or Hospice of Lenawee.